When will my Hexo+ ship? We are currently experiencing a 4 week delay with Hexo+ units shipments. When will additional accessories ship? We are currently experiencing delays for batteries and as a consequence, we will not be able to ship them for the time being. If you’ve ordered only landing gears and/or propellers, your order will ship within 10 business days of placing the order. The Hexo+ won't connect to my phone. If you’re having other issues, check our troubleshooting section for additional help. Can the Hexo+ avoid obstacles? The Hexo+ isn’t currently able to avoid obstacles. You’ll have to make that sure you choose a path that allows the Hexo+ to safely follow you. We’re working towards making this a possibility. For more on specs, check the shop page. What’s the battery flight time? 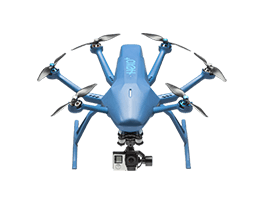 The average flight time for a drone carrying a 3DGimbal and a GoPro is about 10 to 15 minutes. This time can be affected by temperature conditions and general battery care. Check out more information on battery life and care. I'm experiencing a sensor issue. If the Hexo+ app notifies you of an issue with your drone’s sensors, your unit has blinking red LEDs, or your drone takes off and immediately lands, you’ll need to perform a re-calibration of your unit’s compass. You can find the instructions on video below. The firmware update is stuck. If you’re having issues with updating the firmware of your Hexo+, you may follow these steps as many times as needed until the update is completed. Unpair any other devices that are connected to your phone via Bluetooth. Turn on the drone and pair it to your device. -iOs: if the Bluetooth logo in the top right corner is black instead of grey. -Android: you should see an “e” in the top left corner of your screen. Tap to update the firmware once again. While the Hexo+ does fly through light rain or snow, it isn’t waterproof. We don’t recommend that it be used in heavy rain or in large bodies of water but we see no problem with filming water sports that allow for safe take-off and landing on dry ground. For more information on warranty, check our terms and conditions. Our community is very active and eager to help. Join our facebook community to ask all your questions. Our Hexo+ team is also supporting the group.